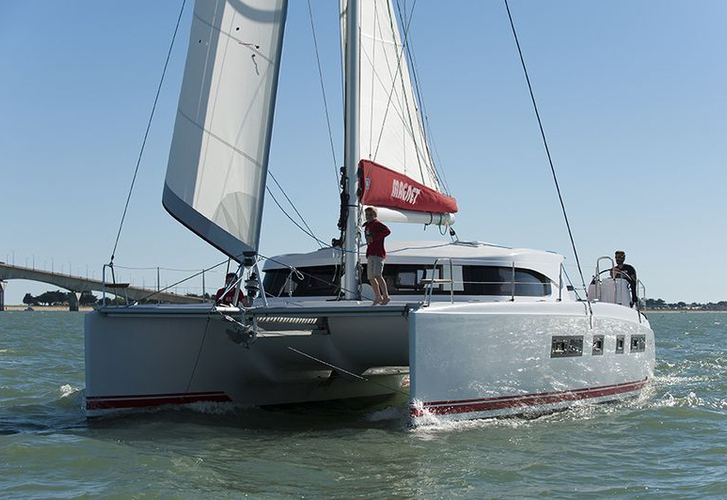 LEP is a name of sailing boat Nautitech 441 ,which has been produced in 2011. You can charter this sailboat from marina Lavrion in the region close to Athens. LEP is equipped with 10 beds. Berths on the yacht are arranged in 10 scheme. 6 cabins are located inside the sailboat LEP. Use our website to find more offers clicking here: Catamarans Athens. Crew members can feel satisfied on this vessel , because there are 4 WC with showers for their disposal. Boat's dimensions are: LOA - 13.47 m , beam - 6.81 meters and 1.2 m of draft. On the yacht you can make use of following equipment: Gps plotter, Autopilot, Gmdss, Mainsail with lazy jack, Anchor electric windlass, Bimini top, Dinghy, Solar panels, Radio cd mp3, Bed linen. . Nonrefundable caution has value 3500.00 EUR. In our search machine you can quickly check avalailability of sailing boat LEP from Lavrion by going to this section: Catamarans Greece.